A simple slipcover in a neutral color. Sound boring? Not at all! Especially when you choose a fabric and seam detail that are unexpected. For example, the fabric vision for this slipcover was grey cotton canvas. I could have easily gone with this basic solid grey 10 oz. canvas. Instead, I chose a 12 oz. yarn-dyed canvas: black and natural yarns woven together to create a two-tone grey color effect. The yarn-dyed color has more depth and interest than a solid grey. It has the look of chambray. Love! For the seam finish, welt cord was the standard choice. Well, it was until I started playing around with a French flange (flat welt). I’m so glad I did! The pretty 1/2″ flange with little pleats placed around the corners soften the chair’s boxy appearance. This entry was posted in armchair slipcovers, canvas slipcovers and tagged grey canvas on November 4, 2017 by slipcovermaker. I love when ideas cross paths just at the right time! 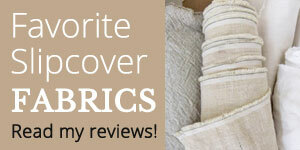 Thanks for following and happy slipcover making.